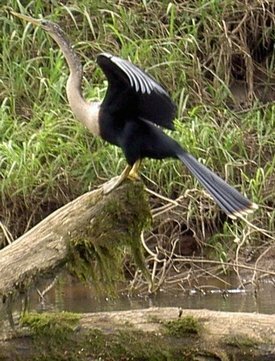 The Anhinga (Anhinga anhinga), sometimes called Snakebird, Darter, American Darter, or Water Turkey, is a water bird of the warmer parts of North America and South America. The word “anhinga” comes from the Brazilian Tupi language and means devil bird or snake bird. Cormorants have hooked bills, and shorter tails and necks. The anhinga is a water bird surely enough, but “I could never see any resemblance to a turkey, and I can not understand how this name happened to be applied to it.” The name “darter” or “snake bird,” both of which are descriptive, seem much more appropriate.